Liberty State Park, New Jersey (CNN) - Not known for throwing out red meat to conservative audiences, former Utah Governor Jon Huntsman warned voters the country is facing an "un-American" future in his campaign kick-off speech Tuesday. Launching his bid for the GOP presidential nomination in front of the Statue of Liberty, Huntsman paid tribute to Ronald Reagan in his remarks. Reagan kicked off his successful 1980 general election campaign from the same spot. "He assured us we could 'make America great again,' and under his leadership we did. I stand in his shadow as well as the shadow of this magnificent monument to our liberty," Huntsman said. Huntsman served as Ambassador to China under President Obama, a sticking point for some Republicans. The former diplomat called for a more civil tone toward the president in the upcoming campaign. 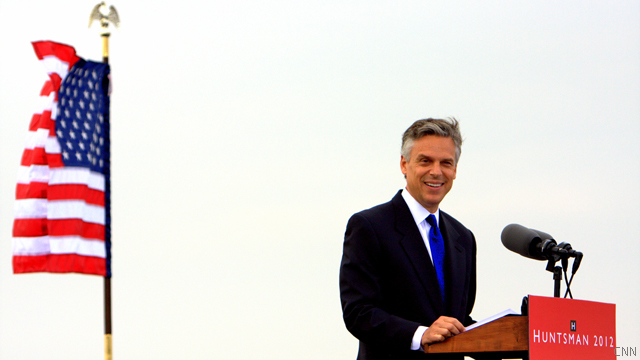 "He and I have a difference of opinion on how to help the country we both love," Huntsman said. "But the question each of us wants the voters to answer is who will be the better president; not who's the better American." The Obama re-election campaign was quick to respond to Huntsman’s announcement speech. “Governor Huntsman called for a more competitive and compassionate country, but he has embraced a budget plan that would slash our commitment to education, wipe out investments that will foster the jobs of the future and extend tax cuts for the richest Americans while shifting the burden onto seniors and middle class families,” the campaign said in a statement. Huntsman and Bachmann can team up and be the McCarthyism ticket. It's a very sad day when all they have to offer Americans, especially after ALL we have been through, is labels of division. I'm so sick of Republicans! Huntsman's support of Paul Ryan's plan lacks compassion to give more tax cuts to the rich off the backs of seniors. "This is totally unacceptable and totally un-American" to borrow Huntsman's projection. Some good points, maintain respect for each other's beliefs and ideology. Always assume we're Americans first and want to continue working for the good of the country but just have different ways to get there. 'A country that is LESS competitive, confident and powerful' quotes Huntsman as his perfectly made-up, model-esq wife dubiously and what appears to be skepticism-looks on. All of these rich guys wives are clones of each other. He is describing perfectly the near destruction and bankruptcy of our country that his party's predecessor dumped on Obama .GWB did more irreparable damage in eight yrs than all that preceded him and no doubt will follow. So when Huntsman attempts to sling his barbs–he best warn his cronies to duck. And just who are these un-Americans and how will we know them? He's speaking in codes. Can anyone explain what an "un-American" future is? If Republicans wants to talk about the debt ceiling then they are going to get burned. Over the past 30 years, the debt ceiling has been raised 35 times. A Republican was in the White House for 20 of those 30 years, which naturally means a Democrat was in there for only 10 of the years over the same period. So to be fair about, the Republican number should be twice as high as the Democratic total. Here's the score, including the 9 increases under Bush, who was second to Reagan. Calling for a civil tone yet implying the actions of his former boss are "un-American." Yet another hypoctite. How dare he try to latch on to the legacy of Reagan. None of these guys compare to him. In fact the party I used to be a proud member of has gone so far off the deep end, that Reagan would never be admitted. Afterall Reagan – raised taxes, expanded the size of the government, ran up record deficits, granted amnesty to illegal immigrants and in the most treasonous act possible for these people, compromised with the other side. The answer to the first question is Barack Obama, the answer to the second is in the eye of the beholder. At least this guy is asking the right question. I might actually support him in 2016 after all as an environmentalist I have a soft spot for endangered species. As a thinking Republican leader Huntman is certainly endangered by the Tea Party's "Reign of Error". Wow! A Repub that doesn't want to slam the President. I wish him luck, but he doesn't stand a chance. The Tea Party RepubliCAN'TS will eat him alive. Funny how he puts "power" before "compassion" and "competitive" before "confident." I have a little problem separating Huntsman from his former boss, Obama. He keeps touting himself as a conservative, but most of what I've read says he's more aligned with liberal policy. We had one of those run in 2008 (McCain) and he lost to Socialist #1. "We are about to pass down to the next generation a country that is less powerful, less compassionate, less competitive and less confident than the one we got. ...Than the one WE got circa 1960?? I'd venture to say that were facing a completely different set of economic, and global circumstances than we did back in the '60's,not the least among them was coming precariously close to our complete financial collapse which would've had global repercussions, and dealing with the threat of domestic and international terrorism. I like the way Hunstman has NOT bowed to the "booga-booga he's NOT one of us" Obama theme so prevalent in his Party. The "less compassionate" part of his speech was a direct reference to his fellow Paty members. So your family selling weapon grade materials to Iran... not un-american? This guy is smart! He took on the Mormons and conservatives in Utah with a very progressive stance. If he waffles and switches to a hard conservative line, he will choke just like the other idiots from Rush and Hannity's camp. The GOP needs a moderate that will not stand down, they need him to save the party. That arched eyebrow of his is intimidating. As a liberal I am scared of arched eyebrows. I guess I should concede the 2012 election. Waht is an Un-American? Doing everything you can to make sure that the President fails in every way. Republicans scream that we need to pull out of the middle east and yet they unanimously voted to go there when the president was a republican. That's called flip flopping ( remember John Kerry?). Remeber their crede "Do as we say, not as we do". Huntsman must be referring to his own party, GOP/Tea Party. The downward spiral started under Bush with two costly wars and Wall Street meltdown. Huntsman is a just another Romney clone with the same flaws, a moderate Republican who does not pass the social conservative/Tea Party purity test. The republican party is dead. They are called "christian nationalists" now. Nobody will ever take them seriously ever again. Un american? Who is it that wants to do away with womens rights? labor laws?equal education opportunnities? rules and regulations FOR we the people. All these things were hard fought for by us...Mothers,Fathers, Sisters and Brothers. A few think their money can buy these things we continue to fight for,leaving the rest of us to spend our days in servitude to them with no chance to pull ourselves up. Wake up people!!!! "Un-American?" Oh, God, that's Bachmann-speak. Who do these people think they are that they define what's "American" and what isn't? They also try to define what's "patriotism" and what isn't. It's really nauseating McCarthyism reborn by people too young to know the dangers of McCarthyism. The Republican agenda has devolved to a level where their whole intent is to have an intolerant fundamentalist religious theocracy where if you publicly doubt that a guy named Jonah really spent 3 days in the belly of a whale, you'll be burned at the stake for heresy and "Un-Americanism.". "We already know the economy is sluggish, what are your solutions.. "
His solutions? He signed on whole-hog for implementing the Ryan budget and repealing and replacing Medicare with Ryan's CouponCare Crapshoot. It's not even debateable: the explicitly lauded the CouponCare program.